Top: Built to A.D. Story’s lines, the new Columbia is a steel replica of the 141-foot William Starling Burgess designed 1923 Gloucester fishing schooner. Above: The original Columbia was lost with all hands near Sable Island in 1927. Columbia will will participate in the Parade of Sail but will not be available for public boarding at Iberdrola USA Tall Ships Portland 2015. On April 17, 1923, the original schooner Columbia was launched in Essex, Mass. Ninety-one years later, a steel replica of Columbia was launched in Florida and she will participate in the Iberdrola USA Tall Ships® Portland 2015 Parade of Sail. The original Columbia was a 141-foot Gloucester fishing schooner built at the historic A.D. Story shipyard of Essex, Massachusetts. 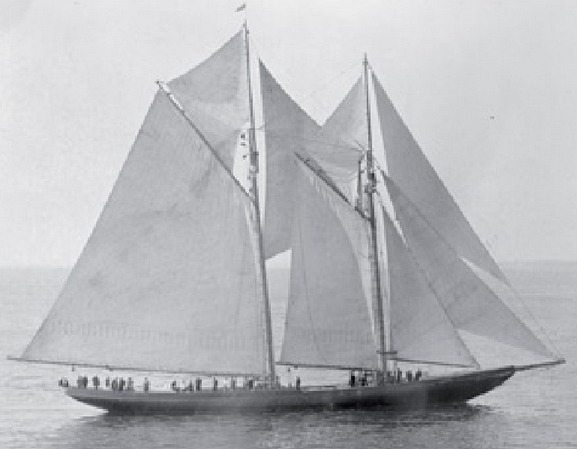 Essex was the center for North American fishing schooner construction just as Maine was the center for North American clipper ship construction. Designed by the innovative William Starling Burgess, Columbia was designed for speed. In the fall of 1923, Columbia challenged the Canadian schooner Bluenose in the International Fishermen’s Cup Races in Halifax. Columbia was narrowly defeated by Bluenose in the race. Tragedy struck August 24, 1927 near Sable Island, the notorious “Graveyard of the Atlantic,” where Columbia was lost with all hands in a gale. Decades later, Eastern Shipbuilding President Brian D’Isernia discovered the original lines for Columbia at the Essex Shipbuilding Museum in Massachusetts. He took the opportunity to fulfill a lifelong dream of bringing a significant piece of maritime history back to life when he decided that Eastern Shipbuilding should build a new version of Columbia in steel.